Welcome to the Best Western Plus Portland! Be treated like family the moment you step into this Portland, TX hotel. Our 24-hour front desk will go above and beyond to provide you superior customer care from check-in to check-out. The American Bank Center is located near our Portland, TX hotel, and is a big reason why many of our guests are in town. There's plenty of fun to be had close to our hotel in Portland, TX. From Hurricane Alley Waterpark to the Texas State Aquarium , families on vacation have no shortage of things to see. Visit the USS Lexington Museum for a little history, or Whataburger Field for one of their many events. Adjoining rooms make large groups and families staying with us keep connected, while still allowing for privacy. There's a microwave and refrigerator in every room of our Portland, TX hotel, making it easy for those on an extended stay. If you're here for business with Kiewit Offshore Services, TPCO America, Sherwin Alumina, Gulf Marine Fabrication or another local company, rest assured that your commute will be easy. We welcome many business travelers here, and our convenient location, expanded business center and quiet rooms make us popular. Our fitness center makes it simple for you to keep up your workout regimen, and our expanded breakfast area with a community table is a great way to start your morning. Enjoy free Otis Spunkmeyer cookies every day in the afternoon, the perfect treat for your getaway. Each room features Serta Dream Sleeper beds with triple sheeting for your comfort. Additionally, each room in our hotel in Portland, TX has a 42-inch flat screen HDTV. Our goal is to make you feel right at home. Whether you're on vacation or a business trip, luxury bedding and well-appointed rooms are a must. If we can do anything more to make your stay special, just let us know. Our staff goes the extra mile to ensure every guest is comfortable. Water Street Oyster Bar: 10.00 mile(s) from Water Street Oyster Bar, full service, seafood, open for: lunch, dinner, Sushi bar and fresh local fish. Mac's Bar-B-Que: 5.00 mile(s) from Mac's Bar-B-Que, full service, American, open for: lunch, Texas style Bar-B-Que. Katz 21: 12.00 mile(s) from Katz 21, full service, steak house, open for: lunch, dinner, Corpus Christi premier steak house and fine dining. Texas A1 Steak & Seafood: 0.50 mile(s) from Texas A1 Steak & Seafood, full service, American, open for: lunch, dinner, offers 15% discount on food only with Best Western room key. Hemingway's Bar & Grill: 22.00 mile(s) from Hemingway's Bar & Grill, bar/lounge, American, open for: lunch, dinner, an exeptional blend of award-winning cuisine and 4 Star atmoshpere. The perfect setting for lunch or dinner. Located in the heart of Rockport downtown district. Republic of Texas Bar & Grill: 10.00 mile(s) from Republic of Texas Bar & Grill, Full Service, Steak House, Open for: dinner, AAA Four-Diamond restaurant in South Texas. La Iguana: 3.00 mile(s) from La Iguana, full service, Mexican, open for: breakfast, lunch, dinner, outdoor patio available. HU-DAT Oriental Restaurant: 2.00 mile(s) from HU-DAT Oriental Restaurant, full service, Vietnamese, open for: lunch, dinner, open from 11am to 2:30pm for lunch. Open 4:30pm to 8:30pm for dinner. Open all day Saturday. Famous for Dallas Cowboy player Dat Nugyen. Crab-N Seafood Restaurant: 15.00 mile(s) from Crab-N Seafood Restaurant, full service, seafood, open for: dinner, located on the Bay between Rockport and Aransas Pass, on the harbor front in City-By-The-Sea. Fishing - 0.50 mile(s) from Sunset Lake, Two mile bicycle course, boardwalk, fishing, swimming, canoe & kayaking, sailing, hiking, and bird watching. Shopping - 8.80 mile(s) from CC Marina T-Heads, Enjoy the Corpus Christi marina life and the T-heads. Everything from the Selena Statue to guided fishing tours, restaurants, fishing, shopping, market days and so much more! Fine dining - 12.00 mile(s) from Katz 21, full service, steak house, open for: lunch, dinner, Corpus Christi premier steak house and fine dining. From: All directions. 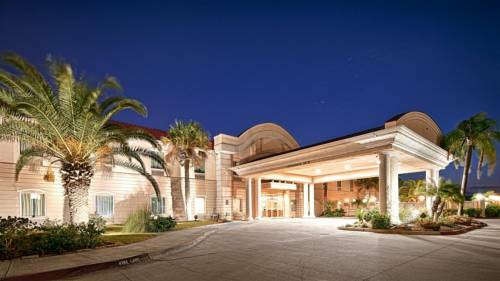 Take Highway 181,10 miles north of Corpus Christi, exit Buddy Genem Drive toward the Best Western Plus Portland. Port of Corpus Christi,12.00 mile(s) from Port of Corpus Christi, This port is the 5th largest port in the U.S.
OxyChem,5.00 mile(s) from OxyChem, Operates chemical manufacturing plants. Texas State Aquarium ,7.20 mile(s) from Texas State Aquarium , Enjoy indoor and outdoor activities. Dolphin show, exotic animal show, sting ray exhibit, over 250 species, food court and many family oriented activities. Also available to rent for large parties. American Bank Center ,12.00 mile(s) from American Bank Center , Concerts, conventions and expo's. Home of the IceRay's Hockey, Islander Basketball teams. Heritage Park,12.00 mile(s) from Heritage Park, Tour nine beautiful Victorian homes & step into a different era. Hurricane Alley Waterpark,8.40 mile(s) from Hurricane Alley Waterpark, Enjoy many water slides including the Cat 5, Momentum and Storm Chaser. Kick back in the lazy river or enjoy a drink at the Riptide Hideaway bar while the kiddos enjoy the USS Dusty. S. Texas Botanical Garden,22.00 mile(s) from S. Texas Botanical Garden, The South Texas Botanical Gardens & Nature Center is a nonprofit, 180-acre botanical garden and nature center. Art Museum of S. Texas,9.00 mile(s) from Art Museum of S. Texas, Events and exhibits for all ages.